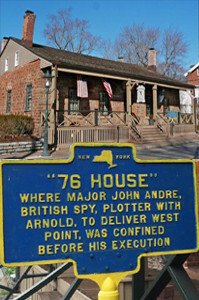 November 23, 2015 – The Old ’76 House in Tappan, New York, is a National Landmark, one where you can eat a meal fit for overthrowing a king. The building itself predates the American Revolution by over a century, and served an active role in the fight for independence. Every major figure including General George Washington spent time at this great American tavern. In 1780, it even served as a make-shift prison for Major John Andre, the British spy caught conspiring with America’s most infamous traitor, Benedict Arnold. And it was here that the British met Gen. Washington to officially recognize the war’s end, and recognize America as a free and independent nation. Learn more about America’s oldest tavern at 76House.com, or by following them at Facebook.com/TheOld76House. And don’t miss our interview with tavernkeeper, Robert Norden, who restored and preserves this unique piece of American history.